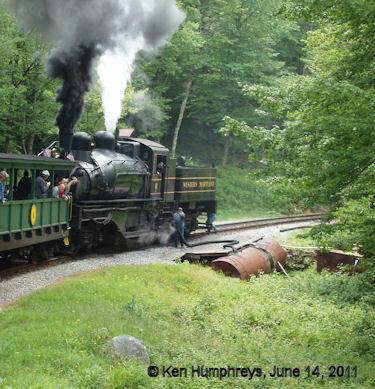 In the Eastern part of the United States, you won't find a more enjoyable steam train ride than taking a trip on the Cass Scenic Railroad in West Virginia. The State of West Virginia quite literally bought the town of Cass and its old logging railroad. The buildings in the town have been restored and many of the old company houses are available for vacation rentals. 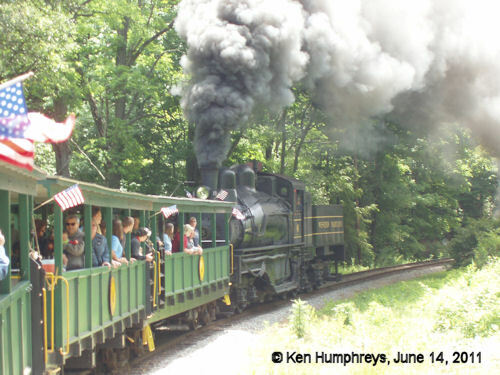 The Cass Railroad owns six three-truck Shay locomotives, one Climax loco, and one Heisler loco. 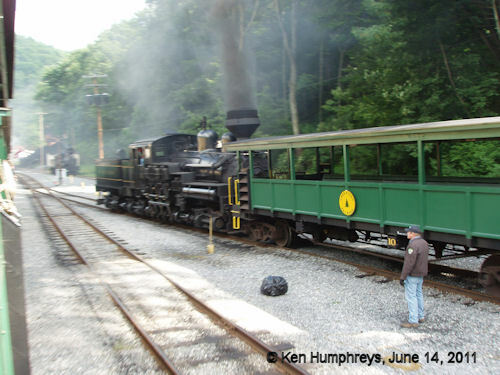 Shay #6 was formerly owned by the Western Maryland Railroad and was used on their Chaffee Branch, a 9% grade. The other locos were all previously owned by various lumber and logging companies. As this was being written, Cass was operating only its Shay locomotives in service. Climax loco #9 (ex-Moore-Kepple Lunber Co., Ellamore, WV) and Heisler #6 (ex-Meadow River Lumber Co., Rainelle, WV) were in the Cass Shop for restoration and recertification. 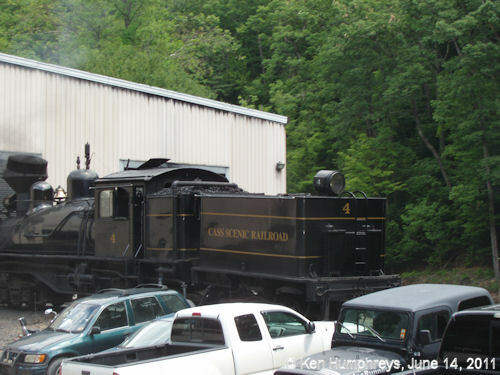 While you can't currently see these two locos in operation, a short 30-minute drive north from Cass will bring you to Durbin, WV where you can see and ride the Durbin Rocket, powered by the only regularly operating Climax locomotive in the country. On the days of our visit to Cass, four of their Shays were under steam making an impressive scene when passing through the shop area with all four in view at the same time. These were #4 (Class C-70, ex. Mower Lumber Co., Cass, WV, built 1922 for the Birch Lumber Co., Tioga, WV as #5), #5 (Class C-80, ex. West Virginia Spruce Lumber Co., built 1905), #6 (Class C-150, , the largest surviving Shay in the world, built 1945) and #11 (ex. #3 of Hutchinson Lumber Co., Feather Falls, CA). At 103 tons, #11 is the second largest surviving Shay in the world. 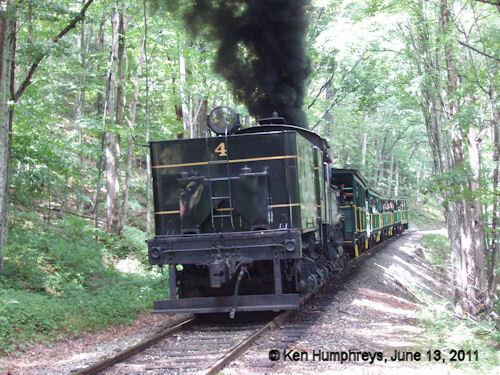 The Cass Scenic Railroad operates four trips on most days from late May through October. On weekends special theme and dinner trips are occasionally added to the schedule. During the day, trips run at 11 AM, 1 PM and 3 PM to Whittaker Station traversing switchbacks and grades as large as 11%. 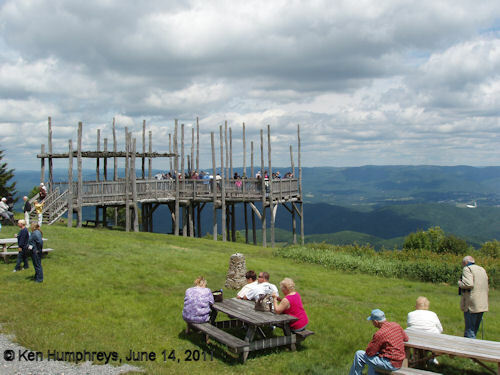 A trip at noon runs to Bald Knob with a stop at Whittaker Station (about 3100-ft elevation vs 2452-ft at the Cass Depot). 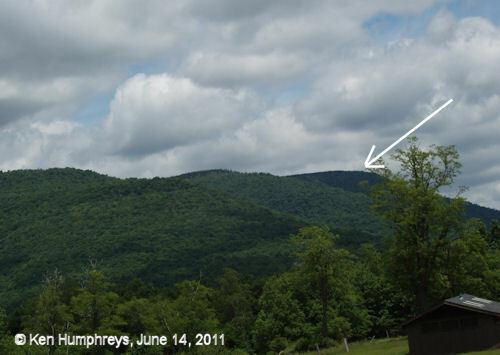 Bald Knob is the second highest point in West Virginia at an elevation of 4842-ft. The train climbs to within 150-ft of the summit. 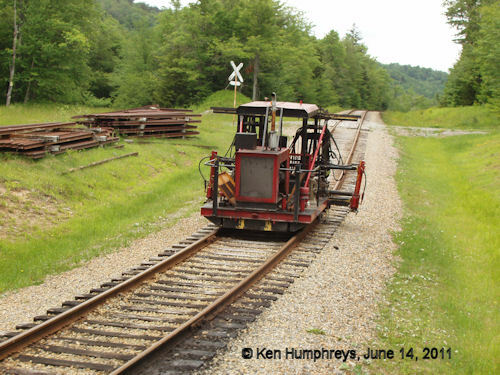 Cass has a reconstructed logging camp at the Whittaker Station and has rental cabooses both at Whittaker Station and Bald Knob for those would would like to spend a few days enjoying the magnificant scenery and train watching. Campers and RVers can also stay at the Whittaker Campground, a privately owned campground which is only a few miles from the depot. The tracks literally wrap around the multi-level campground and railroad buffs have great a train watching opportunity from the tenting area of the campground. The groups of photos below were taken over two days. 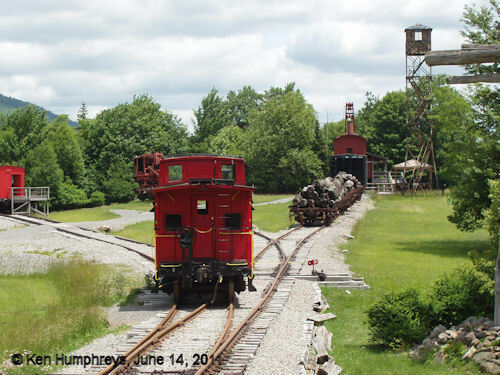 They are but a small sample of the highlights of a trip on the Cass Scenic Railroad. Click on each image below to see its full sized version and related photos. Hit your back button to return and view the next group of photos. 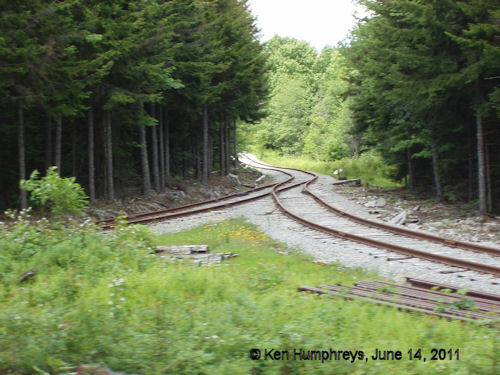 Except for the map of the Cass Railroad, the images are copyrighted by Ken Humphreys. What can you do with an old Shay smoke stack?